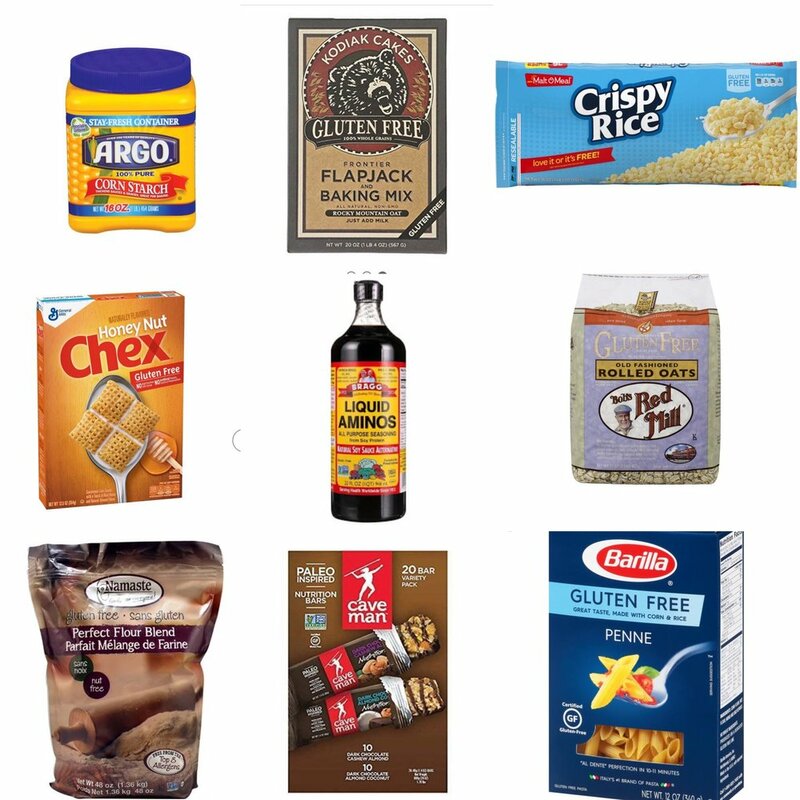 I get asked all of the time about gluten-free staples so I thought I would show you some of my must have things in my pantry. Going gluten-free can be super overwhelming, but it doesn’t have to be if you can find some good staples to make it easier. I shop at Walmart, Costco, Amazon and WinCo for everything. I do not feel like being gluten-free has to be crazy expensive or that you need to only shop at health food stores. Vans Gluten-Free waffles are always in my freezer. I like my waffles with peanut butter and syrup. This is just a simple list of some of my favorite items I keep on hand so I can find something to eat really easily. If you would like some simple recipes as well I have compiled a few of my favorites in my E-Book. Just click this link to check it out. Please share with your Friends or loved one who need gluten-free ideas! HAWAIIAN CHICKEN BOWLS INGREDIENTS * 2 pounds boneless skinless chicken breasts, diced * salt and pepper, to taste * 1 cup barbecue sauce (i used @stubbsbbqsauce ) * 1 fresh pineapple, diced * ¼ cup diced red onion * 1 pound zucchini noodles INSTRUCTIONS 1. Cook Chicken with bbq sauce leaving some for adding to the top. You can bake it at 350 for 20-25 min or use the pressure cooker. 3. Sauté the red onion on skillet. 4. Cut up pineapple and make zucchini noodles. 5. Divide chicken mixture evenly among 8 containers. Divide the fresh pineapple, red onion evenly among the containers as well. 4. If using fresh zucchini noodles add them to containers raw. When you reheat the bowls the zoodles will cook perfectly!! If cooked before they will become too soggy. If making this for dinner sauté the Zoodles with the red onion. I cant take any credit for these amazing power balls. I got the recipe from @cleaneats_cleantreats and they are my absolute favorite energy bites to make! I changed the recipe only according to what I used to make it gluten and dairy free. Almond Joy Powerballs yield 30 balls Ingredients 1 1/2 cups @bobsredmill gluten free old fashion oats (slightly broken down in the blender) 1 cup almond butter ( I got mine at Costco) 1/2 cup toasted (don't skip that) unsweetened coconut 1/2 cup raw honey 1/4 cup @enjoylifefoods life chocolate chips 1 scoop @naturesproperty Chocolate Bone Broth Protien Powder 2 tbsp cocoa powder 2 tbsp chopped almonds 1-2 tbsp coconut milk (start with one, depending on the consistency you may not need to add the other) 1 tbsp coconut oil, melted 1 tsp almond extract 1/2 tsp vanilla extract 1/4 tsp sea salt Instructions Combine all dry ingredients in kitchen-aid mixer bowl. Mix on low until ingredients are well blended. Add wet ingredients to blended dry ingredients. Mix on medium speed until a "dough" forms. Scrape sides of bowl with a spatula and mix again if needed. Remove bowl from Kitchen-aid stand. Using a 2-inch cookie scoop form dough into balls. Set balls on a parchment lined cookie sheet or storage container and refrigerate for at least one hour or until ready to eat. Keep refrigerated up to one week, if they last that long! Enjoy! Monday Meal Prep Menu Blueberry Pancakes Breakfast Muffins Penne Sausage Pesto Bowls Balsamic Chicken With Roasted Brussel Sprouts Ham Fried Cauliflower Rice BBQ Hawaiian Bowls Chicken Salad Mason Jar (not shown) Almond Joy Energy Bites (not shown) Check my insta stories from today to see step by step instructions on how I made each meal! Which recipe are you most excited for me to post this week?